Braintree and Brighton, MA (August 25, 2017) – Charlesview Residences in Brighton, a property managed by full-service real estate and property management firm Peabody Properties, was recognized as the top Crime Watch Group of the Year during the recent National Night Out, an annual community-building campaign that promotes police-community partnerships and neighborhood camaraderie to make neighborhoods safer, more caring places to live. 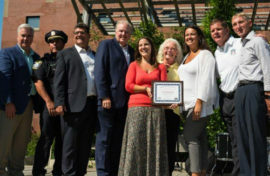 Charlesview Residences was selected based on a variety of programs offered at its Josephine A. Fiorentino Community Center, including computer and music lessons for youth, wellness classes for seniors, and English as a second language for the immigrant population living in the Allston-Brighton community. “What an honor to be recognized for the exceptional programs we consistently aim to offer to improve the quality of life for all,” said Barbour. “We are incredibly proud of our staff for all they’ve done to contribute to this achievement,” she added.